Charles Clapp, Jr. THE BIG BENDER. New York: Harper & Row, 1938. The Oxford Group preceded A.A. and has some of the same ideas - especially the idea of the group and sharing and possibly the Higer Power.The OG program emphasized acknowledgment of offenses against others, making restitution to those sinned against, and promoting the group to the public. The London newspaper editor Arthur J. Russell joined the Oxford Group after attending a meeting in 1931. He wrote 'For Sinners Only' in 1932, another valuable and much desired book as a first edition. 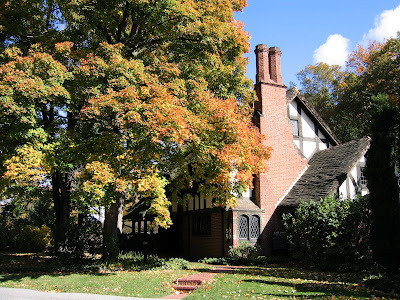 The founders of Alcoholics Anonymous, Bill W. and Dr. Bob Smith, were inspired by Oxford Group principles.Our photo above shows the Gate House of the Seiberling Estate in Akron where Bill W and Dr. Bob met and talked for 6 hours straight. Akron was something of an Oxford Group Centre and an alcoholic scion of the local rubber tyre family, one Bud Firestone, had managed to knock drinking through association with Oxford Group members. The full story can be found at these Oxford Group pages. VALUE? Early A.A. and Oxford Group literature has been collected for quite a while and started making good prices in the late 1990s. One used to receive long lists of Oxford Group and early A.A. books, many manifestly Christian, one presumes that alot of collectors have now found most of the books and new collectors are not necessarily being generated. It doesn't seem to have moved on vastly and may have levelled off but it is still a good collecting area. It is important to note that Bill Wilson's faith system was not based on Jesus Christ and Him crucified; nor is there any mention of Jesus Christ being the Savior from his sin. Both he and Bob Smith (co-founder of AA) embraced and promoted a variety of spiritual experiences, which included practicing spiritualism and conversing with the dead (which the Bible forbids) and being heavily involved in séances. Wilson also acted as a medium or channeler. It was while involved in these types of religious experiences, not Biblical Christianity, that Wilson developed his Twelve Steps (Pass It On, pp 156, 198, 275, 278). Oh dear. The religious would condemn every alcoholic to death rather than accept that alcoholism is an illness, not (of itself) a sin. AA's early literature is murky with its inability to fully assert the case. Many early members WERE obsessed with considering themselves sinners in need of correction, rather than the sick, needing to be well. Wilson's 'spirituality' doesn't hold up to the standards of most evangelicals, or any atheists. But it was enough to keep him sober. And perhaps his, and others, embarrassment over his enthusiasms helped keep AA from being suborned or co-opted by religious ambitions. Charlie Clapp was a "fringer" in the Oxford Group (OG) 1933-5 but truly devoted for a few years (c.1935-40): this book reflects Group allegiance. Clapp was born-again in Calvary Church; he must have had an Episcopalian sponsor. What's especially interesting, Clapp credits an anonymous alcoholic with the key to his sobriety. Wilson (not Episcopalian; never confirmed Xtian; nit church-going; no OG's sponsor) was ostracized c.March 1937; Clapp's first book was written July-November 1937. Clapp was, however, Wilson's own protege/pigeon and one of the very first ex-alcoholic successes that Bill W. had in New York. This book may provide key insights into Wilson's true (uncredited, unpublished and mostly unsuccessful) methods, independent of and totally outside the 'Soviet version' of AA History. Much of that 'early AA history' Wilson started fabricating in the late 1940s is revealed as false, make-believe. For example, it's obvious there was no Oxford Group "Six Step Program," bogus stories about the writing of BB were assembled (to bury the ghostwriting), coverups of financial discrepancies, Parkhurst was repeatedly paid off, etc. Clapp's book is from from all that! In his second book, Clapp identifies Bill Wilson by name and discusses New York AA c.1941 in detail. (Clapp was NOT then a member of AA but did join in late 1945.). For those interested, see Drunks are square pegs, by Charles Clapp, Jr. (January, 1942) pp.54-60;89-90. Bill Wilson didn't have a Church; he certainly did NOT have a Roman Catholic priest or nun as Sponsor. Wilson definitely practiced spiritualism of the parlour-variety, but he seems to have been more an open-minded seeker in the 1940s and 1950s. It's also true that AA's spiritual dogma (insofar as people quote and instruct from the 1939 version) is rhetorically and fundamentally NOT Christian. Read carefully, the Big Book is more 1920s Theosophical: salvationist, neo-platonist, self-help - listen to your inner daimon. Stepping Stones Archive preserves the oldest draft: a Four Step program written in 1938 and obviously derived from the Oxford Group. That program (our term, NOT theirs) was abandoned, radically revised. But Wilson didn't have any writing skills or the time to "develop his Twelve Steps" himself in June-December 1938, so we ought to look elsewhere for the source(s), the core of the Program. Not plagiarized and NOT Oxford Group either, the Steps develop out of overtly evangelical Christian writings geared towards Anglo-American intellectual materialist-pagans of the early 20th C., just w/o the Jesus bits. The Big Book is a metaphysical masterpiece, a beginner's textbook for practical personal transformation and evolutionary consciousness; Clapp's book is an amateur attempt, by contrast. But I suspect Bill W.'s resentment that his pigeon began to write The Big Bender ms. was the impetus or goad, in the Fall of 1937, for the entire 12-Step movement we know today.